The first time I came across this poem at wildness by Derrick Austin, directed there via Twitter (and I think I retweeted the link before reading the poem, and am happy I did), I stopped and thought: wow! It is only one stanza, with a sonnet's brevity and length, but as only poetry can do, it achieves quite a bit, pointing our gaze both towards the Italian Renaissance painter Paolo di Dono, also known as Paolo Uccello's (1397-1475) work and life--"His name meant Humble Bird"--and beyond the poetic frame, to the absences in our knowledge about Uccello's and everyone's lives that imagination and emotion fill in, as well as that "grief and art" from somewhere just outside our ken that arrive sometimes when we expect them, but also when we do not. Yet, as every poem reminds us, we have the aesthetic artifact itself as a gift, a form of proof, of consolation, however, brief, and the best poems, no matter how difficult or painful the subject matter, the themes or the content, are also little vessels of beauty. Also embedded in the choice of Uccello, I think, is his fame as a pioneer in the development of perspective in visual art; his mastery of depth of field was legendary, particularly in the paintings that the poet names, depicting the Battle of San Romano. That theme, perspective, is crucial to this poem. So: this poem, is a work of speculation, and may be about work that does not exist, which is another component of its charm. Unlike the other works I have posted so far, for which there is an artwork or artworks (cf. Rilke and Aragón) to which we can refer as a source of sorts, a touchstone, in the case of Uccello, there are winged angels and dragons but from my cursory searches, as Austin's poem suggests, no birds. Into this negative space, Austin pens his beautiful poem, much as Giorgio Vasari had to fill out his sketch of Uccello's life beyond the facts and anecdotes that he could glean, the interpretations he could make based on the paintings themselves. Derrick Austin is the author of Trouble the Water, which poet Mary Szybist selected for the 2015 A Poulin Jr. Prize and which was published by BOA Editions in 2016. 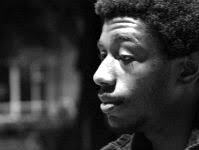 A Cave Canem fellow and MFA graduate of the University of Michigan, he was the 2016-17 Ron Wallace Fellow at the Wisconsin Institute of Creative Writing, and serves as Assistant Poetry Editor at Memorious. I follow him on Twitter and you can too, at @ParadiseLAust. You can also find more of his poetry, and other writings, at his Tumblr site, The Mad Scene. Copyright © Derrick Austin, 2018. All rights reserved.